The list of makeup brushes available in the market is endless. Your face alone has a myriad of options including foundation brush, stippling brush, contour brush, concealer brush, fan brush; just to mention a few. For your eyes, there is an assortment of brushes including smudging brush, crease brush, medium blender, shadow brush and many more. Lip brushes are also varied. In a sea of makeup brushes, getting confused is not uncommon. Without clear information on the right brush, buying online becomes harder. This guide delves into the most important makeup brushes and gives you practical tips on how to buy online. 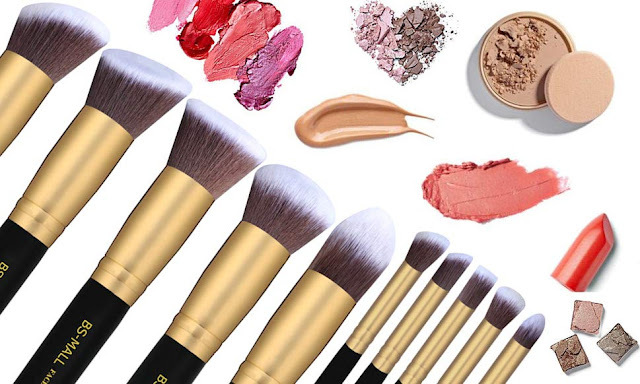 Why do you need makeup brushes? Just like the name suggests, this brush facilitates the application of the base or foundation. This type of brush comes with a tapered tip as well as packed bristles to provide the most even application. The best foundation brush is one that is of very high quality. You can choose a brush made using synthetic or natural bristles. The natural options are made using animal hair from goats among other animals. Synthetics are man-made from nylon, polyester among other fibers. Each option has its merits. - When buying online, know the types of brush bristles used. Some people use this brush to apply their foundation. It also works great when used after your foundation brush. It works to provide an airbrush effect. The bristles are usually feathery and light. This is a sure way to achieve a flawless look with little effort. - When buying online, consider whether the brush is antibacterial or not. This is one of the most popular brushes because it is used to conceal or correct spots. It works really well with good quality makeup. The brush is designed to help blend in products so that you can have a flawless natural look. It should work to target small areas so that every detail can be covered. - The best concealer brush to buy online is one with flat bristles and a pointed tip. When you wish to quickly touch up your makeup, this brush is ideal. It allows for a light touch that does not affect other elements of your makeup. It is used with loose powder which is compact to give you that fresh light touch. This brush is soft and feathery to evenly distribute the powder on your skin. - Choose a powder brush that is shaped like a dome when buying online; it facilitates a light brush-up as needed. Contouring in makeup has gained a lot of popularity over the past few years. A high quality contour brush allows you to shape your face as desired for that sculpted look. This brush will have firmer bristles and the tip will be more angled. It allows you to shape your face in a desired way. - Choose a contour brush (and others) online from a trusted brand; this way, you get the excellent results. This is one designed specially for highlighting. The brush mainly comes with bristles that are spread out to optimize the amount of product used. Areas highlighted include the cheekbones and other areas of the face. Using this brush lightly is the best way to highlight professionally for a more natural look. - When buying online, chose a versatile brush that uses powder, liquid and even cream highlighters. This is an excellent brush that facilitates the blending of eye-shadow after application. To have a perfect look, your eye-shadow must look seamless and harmonious. This brush plays a pivotal role in this respect. - When buying online, consider a blending brush with dense but soft bristles. This is a versatile brush that can be used for both the eye line and eyebrows. Filling out your brows has never been easier and you can achieve the look you desire most. With its sharp end, you get to draw an eye line that is perfect. - Choose a brush that has a stiff and short cut for the perfect results. This brush is made to give you utmost precision in product application for your eye lines. Eye makeup has to be done just right for perfect results and picking up the best brush is critical. With this brush, you can apply eye-shadow with great precision. Also, you can use both cream and powder products to make your eyelid pop out. The bristles must have the perfect texture to blend eye-shadow in the most flattering way. - Choose one with flat, short and large bristles for the perfect application. To achieve a soft tan look, this is the ideal brush to apply bronzer. The brush is mainly big, fluffy and rounded to apply the product evenly. The idea is to create a natural bronzed-out look. - Buy a brush that can be easily retracted and covered for storage to your delight. There is another level of lip perfection and it can be achieved using a lip brush. This allows you better precision. From perfect lining to even distribution of lip product, there are many benefits. - Examine products online and choose a lip brush that is both firm and soft on the lips. Many people will just use the wand or brush that comes with the product for the eyelashes. However, if you are particular, choosing a specialty mascara brush is the way to go. This way, you achieve an excellent job for that stunning eye look. - Silicone mascara wands or brushes are great; choose ones that curl, lengthen and add volume to the lashes. This comes with a foam tip designed to help soften the harsh line of an eye pencil. The brush can also be used for eye-shadow application to give the most attractive look. - Online, you can buy a smudge brush that is double ended with an eye pencil. If you want that dramatic eye, applying eyeliner deep in the lash line will give this effect. This is best done using the flat eyeliner brush. This is also the most ideal brush for a smokey eye finish. - Compare various makeup brush brands online before making your decision. Read real user reviews for more insights as well. - Because there are so many kinds and types, buying all of them is not really necessary. However, the most important ones are a foundation brush, concealer brush, contour brush, crease brush and a blending brush. These are considered the basics for those who want to simplify their makeup regiment. - All makeup brushes must be thoroughly cleaned at least once a week. This will help kill bacteria and remove debris. In turn, you can keep your complexion clear of blemishes. - Natural bristle makeup brushes are best for powder products. On the other hand, synthetic bristle brushes are great for liquid and cream products. - For full application and coverage, choose short bristle brushes while the long bristle brushes will offer a softer application and coverage. - When the brush begins to shed and cannot be cleaned any longer, it is time to buy a new one. If the handle breaks, this is another sign to toss it. - Makeup brushes come in various colors from handles to the bristles. Choose your most preferred shade; color does not affect the brush functionality. In Kenya, some of the most convenient online stores to get the best makeup brushes are Jumia and Kilimall. Buy sets of up to 24 brushes at a very fair price. Before buying, read all relevant product information available. See what others say about the products. Only shop from professional online stores that are certified and have product quality guarantees. Some fake makeup brushes are made using toxic materials, read my guide on avoiding counterfeit products online HERE. Beware of very cheap makeup brushes as well.